As part of its 25th Anniversary Celebration, Northern Community Mediation (NCM) decorated one of the tables at Women Can/Women Do in both Charlevoix and Petoskey.The Charlevoix event was held at Castle Farms on Wednesday, June 13, and the Petoskey event was held at the Lange Center in Bay Harbor on Wednesday, September 12. 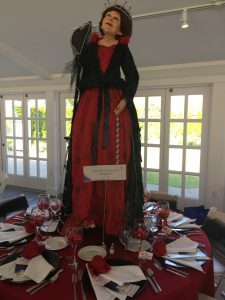 NCM’s theme for the table was the “Queen of Hearts.” The NCM staff is forever grateful to William of Monarch in Petoskey for his assistance in designing the table. He even loaned us his Queen of Hearts. The staff had so much fun doing working on this project that it was decided that NCM would design a table for both events in 2019. In fact, an interesting theme has already been determined. The Charlevoix party will again take place at Castle Farms on Wednesday, June 12, and the Petoskey celebration will be at the Lange Center on Wednesday, September 11.